Ipswich, that place at the end of the train line that you’ve heard about but never actually been to. Yep, that is indeed the same Ipswich we’re talking about. And that’s just the thing, we really need to talk about it. Ipswich is actually the best, you guys! It’s so much fun we’re starting to think they've been keeping their epic eats and picturesque scenery to themselves to keep us away and save all the good stuff for themselves. When it’s only a 40-minute drive away, you’d be a fool for not checking it out for yourself. If you don’t believe us, here are some of the things that make Ipswich the best. Did someone say road trip?! A menu that includes frickles—that’s pickles coated in beer batter and deep fried in case you didn’t know—is an instant winner in our eyes. Brisbane, lift your game. But that’s just the beginning, folks. These guys have also built themselves a name for their niche brews, including a s’mores beer and, even a carrot one. It’s the first microbrewery of its kind and is the first microbrewery to call ol’ Ippy home since 1903. The building is over 100 years old too! German food mecca, Heisenberg Haus, has the best nibbles this side of Bavaria. The family owned restaurant is an ode the ‘Switch’s German roots. Aside from boasting a huge array of German beers—Lowenbrau, Paulaner, Spaten, Stiegl and more—all your fave German foods are on the menu, too. There is, of course cheesy spätzle, vegetarian strudel and a classic schnitzel. If you’re feeling especially hungry though, there’s the pork knuckle with bread dumplings, beer gravy and special sauerkraut. It’s no mean feat though, if you finish the dish you get to have your photo on the wall. There aren’t many photos on the wall, though #justsaying. Rafter and Rose’s set up is so adorable you’d be forgiven for thinking you were in Notting Hill. But you’re in Ipswich, remember. This too cute for words laneway and café duo does it all; a killer eggs benny, bacon jam, and fresh local produce. Their pastry selection is to die for, too. If you’re all about boards—be it a cheese board or a charcuterie board—then we have a feeling you’re going to love Journey’s. These guys even do a DIY board so you can craft the spread of your dream; complete with calamari, pork belly and all of the cheese. As if that wasn’t enough to get you packing the car for Ipswich, there’s also a waffle burger, people (a freaking waffle burger!) packed full of Cajun smokey BBQ pulled pork. Oh, and it’s gluten free too. If you’ve ever wanted to go hot air ballooning, this is your chance. These guys are the closest to Brisbane and show you the most incredible views. Only 30 minutes’ drive from Brisbane and you’ll find yourself up in the air looking down on the seriously stunning Ipswich region. Thought you had to schelpt it all the way to Stanthorpe for a winery? Not quite, my friend. Ipswich has you covered too. Ironbark Ridge Vineyard sits atop a ridge with a stunning vista out across Pine Mountain and Mt Flinders. The eight-and-a-half-acre vineyard is ripe for exploring while the original 1920s miners’ cottage is the perfect cellar door stop. If a helicopter pub crawl wasn’t on the top of your to-do list, we’re guessing it is now? Thanks Ipswich! 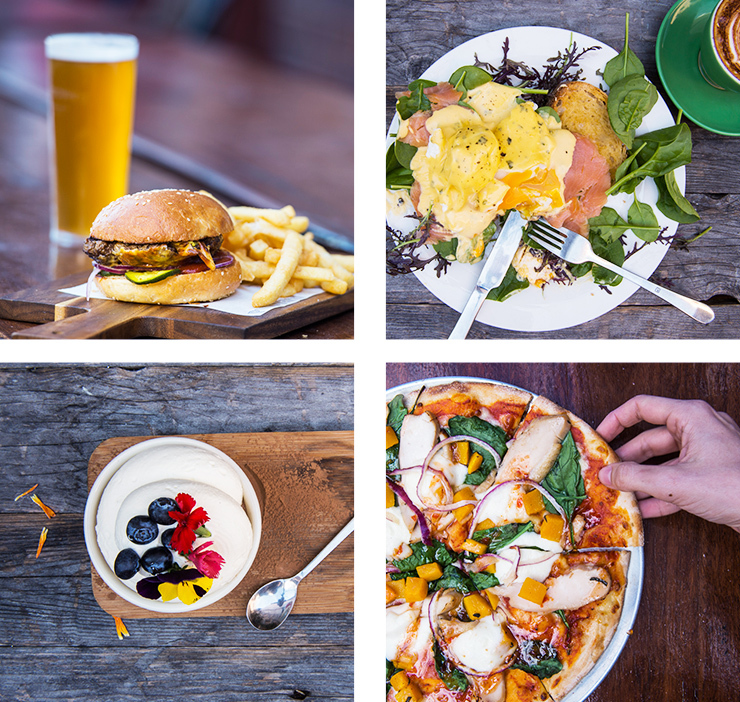 These guys will take you—by helicopter, no less—to all of the best food spots Ipswich has to offer and show you how to match your bites and brews perfectly. Everything is produced locally and the tour is designed to showcase the best the region has to offer. If hiking is your thing, Ipswich has some pleasant surprises in store for you. Even if hiking isn’t your thing, White Rock has tracks that range from 200m to 19kms, so there’s something for everyone. White Rock itself is stunning: a striking white cliff face that juts through the surrounding trees, is well worth the foot work. Lovers of theatre, architecture and a good time take note, because the Incinerator Theatre is where it’s at. It’s, erm, colourful history as a waste incinerator site only add to its character. Plus, it’s the only building in Queensland designed by Burley Griffin (the dude who designed Canberra—cool, huh?). Stop by for a play or to sit in on rehearsals. Spicers Hidden Vale is potentially one of the fanciest places on earth. And it’s in little old Ipswich, who would have thunk it? With an infinity pool overlooking the undulating planes, fresh produce from their own gardens and local farmers, seriously luxe fit outs, plus their award-winning, hatted restaurant, Homage, will actually blow your mind (and your taste buds)! The Gypsy Cottage feels like a fairy tale. Set amongst green, rolling hills with a view that never seems to end, you’ll never want to leave. Complete with a four post bed, a baby cow (omg) a fresh fruit platter and a fire place, this really feels like heaven on earth. Brisbane, who? Keen to hot foot it to Ipswich? Click here for all the deets! Like upcoming events like the Ipswich Festival and the Watercress Creek Olives and Limes festival. This article is sponsored by Discover Ipswich and fully endorsed by The Urban List Brisbane. For more information on our editorial policy please click here.